Focusing on solar, e-mobility and multiple other applications, ZETTLER Group will showcase various new relays at this year’s November electronica show in Munich, Germany. The new AZEV116 and AZEV132 series are next-generation IEC mode 2 Electric Vehicle (EV) charging relays in development for release in 2019. These relays are designed to survive high momentary currents that may occur on short circuits, thus ensuring outstanding reliability without contact welding. 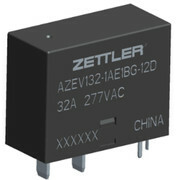 The AZEV116/132 series will also feature a potential monitoring contact, as required by IEC62752:2016, making these types of relays ideally suited for EV and other applications demanding high security and safety demands. The newly developed AZSR1160 is a 160 A extreme high-power PCB Solar Relay, designed for PV applications of up to 36,8 kVA (single phase 230 VAC) / 111 kVA (three phase 400 VAC) – a highly attractive, small footprint substitute for conventional contactors. This relay is suitable for large commercial / rooftop-based PV systems and commercial solar fields. 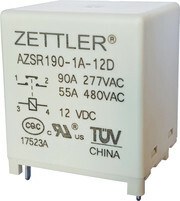 AZSR190 is a 90 A high-power PCB relay for solar inverters. Developed for PV applications of up to 23 kVA (single phase 230 VAC) / 69 kVA (three phase 400 VAC) this relay is well suited for medium sized to larger roof top-based / commercial systems. AZSR165 is a 65 A economy version of the new AZSR190 series. Developed for PV applications of up to 18,4 kVA (single phase 230 VAC) / 55 kVA (three phase 400 VAC) this relay is well suited for medium sized to larger roof top-based / commercial systems. ZETTLER recently also adapted this relay for a DC-side solar battery storage application, supporting a major industry player in clean home-energy solutions. ZETTLER AZSR131 was initially designed as a solar relay for residential and small roof top-based PV systems of up to 8 kVA (single phase 230 VAC) / 24 kVA (three phase 400 VAC). 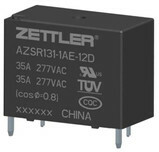 While not a new relay, ZETTLER continues to find new application extensions for this relay beyond just PV solar inverters. AZSR131 is suitable for diverse applications such as heat-pump solutions and Electro Vehicle wall box charging units and is, therefore, rapidly becoming a multi-purpose relay. AZDC6 is a 600VDC miniature relay for RSS (Rapid Shutting Down System) for Solar installations, scheduled for 2019 release. The compact size allows for a thinner design of certain RSS boxes, that are deployed as part of compliance with 2017 NEC 690.12.